Everyone has those places right on there doorstep that they never visit. 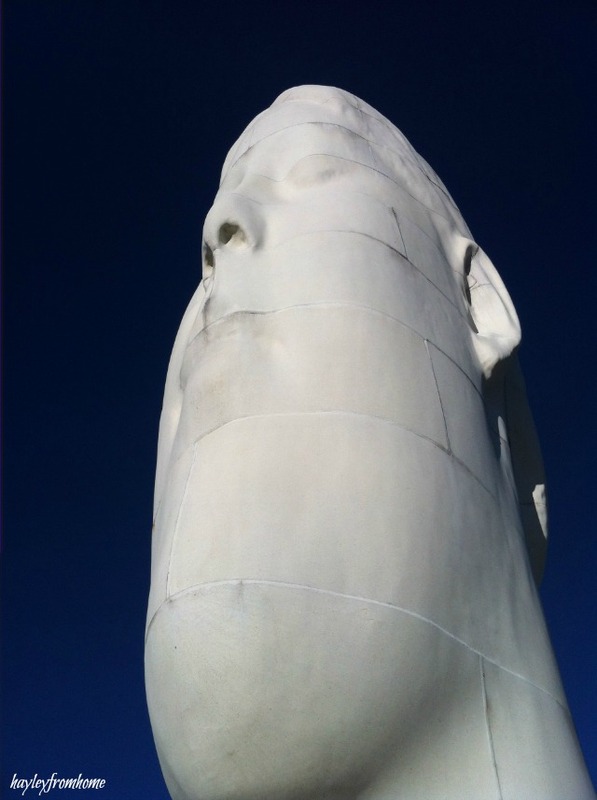 The town I grew up in and moved back to last year took part in a Big Art project nearly 7 years ago; this saw a monument being designed by Jaume Plensa and built on an old colliery site to pay tribute to the town’s mining history. It’s interesting that the ex-miners rejected the artists original idea of a miner’s lamp as it was too obvious but they loved the conceptional idea of a girl’s face. Dream takes the form of a 20 metre high girl’s head with her eyes closed, seemingly in a dream-like state, resting on a plinth bearing the inscription “Dream Sutton Manor” inspired by the small, circular “tally” each miner carried as a means of identification. The Dream concept was not only the artist’s response to the brief and its ex terra lucem “Leitmotif”, but also directly informed by Jaume’s conversations with the ex-miners and other members of the local community about their aspirations. What had clearly emerged from these discussions was that, far from wanting a mining monument, they sought instead a forward-looking piece that would provide a beautiful, inspiring, contemplative space for generations to come. I remember watching the Big Art programme on television but we have never visited the Dream sculpture. You can see it from the roads as you drive past the site and as we had a beautiful crisp day last weekend we wanted somewhere to different to walk; the sculpture is within the Mersey Forest so it was a lovely stroll up to the statue, although Lucas wanted to be carried up the hill! The 20 metre sculpture looks pretty spectacular and the cement is a special bespoke mix deigned to make it look almost luminous white. I liked that you can’t really see it as you walk round the forest so it is revealed as you turn a corner. It looks amazing against a beautiful, blue, autumnal sky and despite having plenty of viewers it is a very peaceful space. There’s plenty to explore right on our doorstep, I should really get out there! Very surreal looking and wondrous. What a wonderful monument with such meaningful sentiments. It’s sighted in a very picturesque place and as you say the sky is a stunning backdrop. Thanks for linking up and sharing with Country Kids. It’s really beautiful, but isn’t it odd that they went for that rather than something more obviously linked to mining? The stone looks so smooth and stands out wonderfully against the blue sky. Wow, I agree this is beautiful!